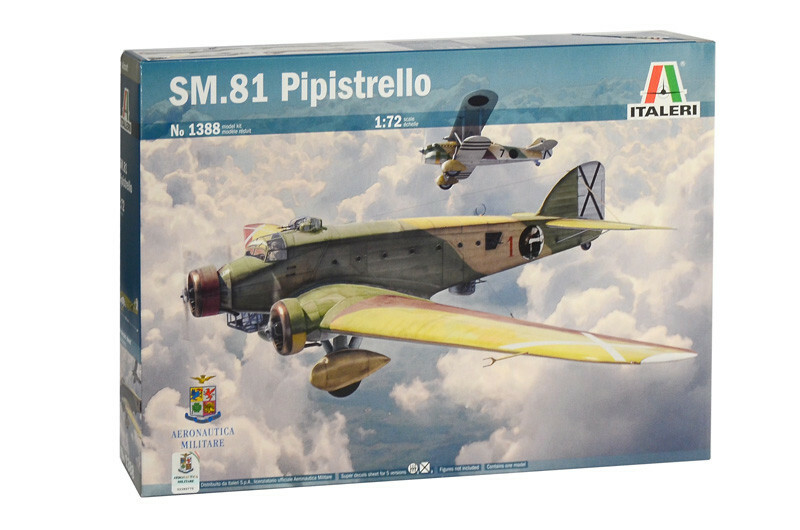 The Savoia Marchetti SM 81 began service in the bombing units of the Regia Aeronautica (Italian Royal Air Force) around the middle of the 1930’s. It operated in the campaign in Ethiopia, in the Spanish Civil War and during World War II. It had three engines with low wings and a fixed undercarriage. It was propelled by 3 Alfa Romeo 125 RC 35 engines with 650 Hp each, or, successively, by more powerful Piaggio P. X RC.35 700 Hp engines which brought it to a maximum speed of 340 Km/h. Armed with 6 7.7 mm Breda-Safat machine guns, it had an offensive payload of 2,000 kg in bombs. At the time of its entrance in service, it was one of the most modern bombers in the world, but at the start of World War II, by then surpassed, it was predominantly used for night time missions. For this reason it was nicknamed “bat”. Nevertheless over 300 SM 81’s equipped the Regia Aeronautica squadrons on various fronts, from the Aegean Sea to North Africa.